Apple today filed the definitive proxy statement concerning its fiscal 2018. Aside from revealing executive salaries, compensations and bonuses, the SEC filing includes a bunch of tidbits such as the company’s milestones, growth figures, the cost of flying private and more. 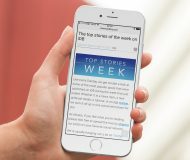 During his opening remarks at the start of the September 2018 “Gather Round” media event, Cook revealed that Apple was close to shipping a two billionth iOS device. The SEC filing mentions this milestone, but doesn’t say when it was achieved. The iPhone XS/XR event was held on September 12, 2018 and Apple’s fiscal 2018 ended September 29, 2018, which means that the company hit that milestone before September 29. Here are all the milestones and achievements Apple disclosed in the filing. Compensations to executives in form of base salary, non-equity incentives (awarded based on performance), bonuses and other compensations are tied to business results. One number that stuck with me: $37.19 billion in Services net sales, a 24% increase. That’s an incredible achievement no matter how you look at it because you must consider that, up until recently, Apple was a hardware company, not a services company. Its Services segment includes iTunes and App Store revenue, Apple Music and iCloud subscriptions, Apple Pay, AppleCare and more. Apple expects Services to account for about 60% of its revenue gains over the next five years, in contrast to the 86% of sales growth in the past five years (attributed to iPhone). Having a huge number of devices in the wild certainly helps grow Services sales—Apple has 1.4 billion iPhones and other iOS devices in active use and earns an estimated $30 for each device from services, according to Morgan Stanley. 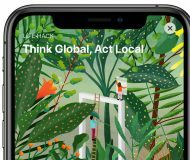 As Apple’s fiscal 2018 ended September 29, 2018, its recently raised guidance for the yet-to-be-reported holiday quarter will be factored into fiscal 2019 compensations. Tim Cook’s total compensation in fiscal 2018 topped $136 million. 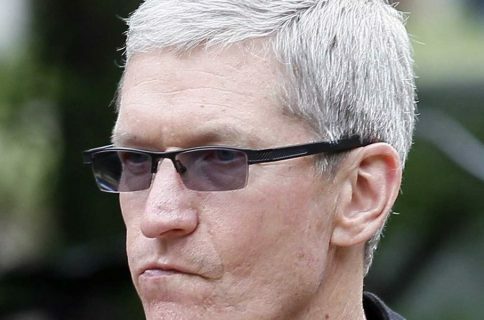 Apple spent $294,082 on Cook’s private flights and $310,981 on his personal security. 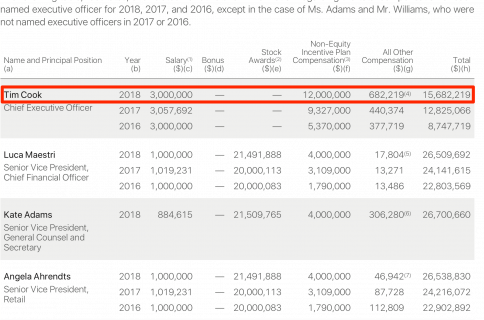 The table below lays out the vesting of restricted stock units that were previously granted to key Apple executives. Cook’s massive stock incentives are part of a grant awarded to him after becoming the CEO in 2011. 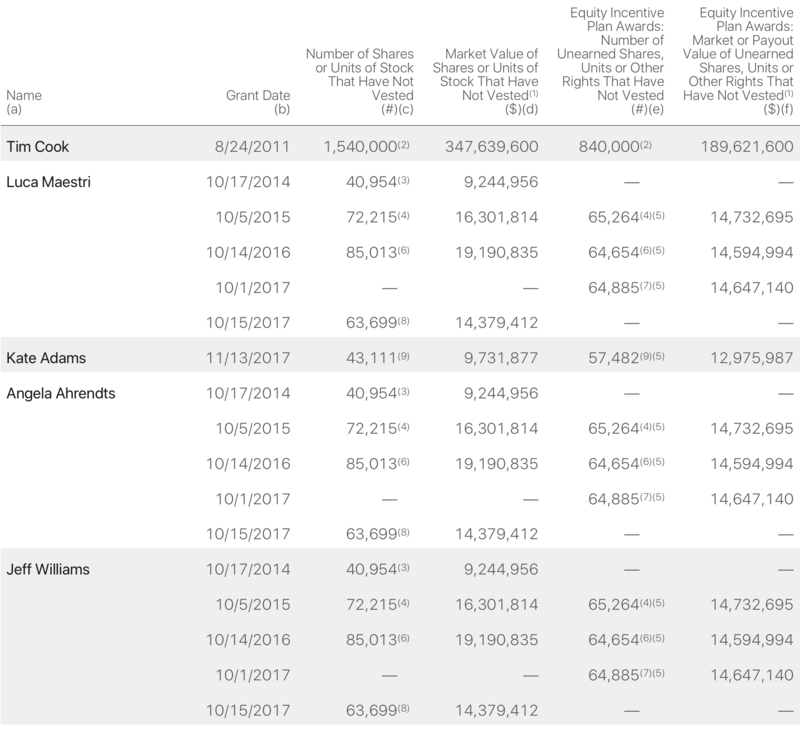 Cook still holds over 1.5 million shares that haven’t vested, worth approximately $189 million at the current share price. 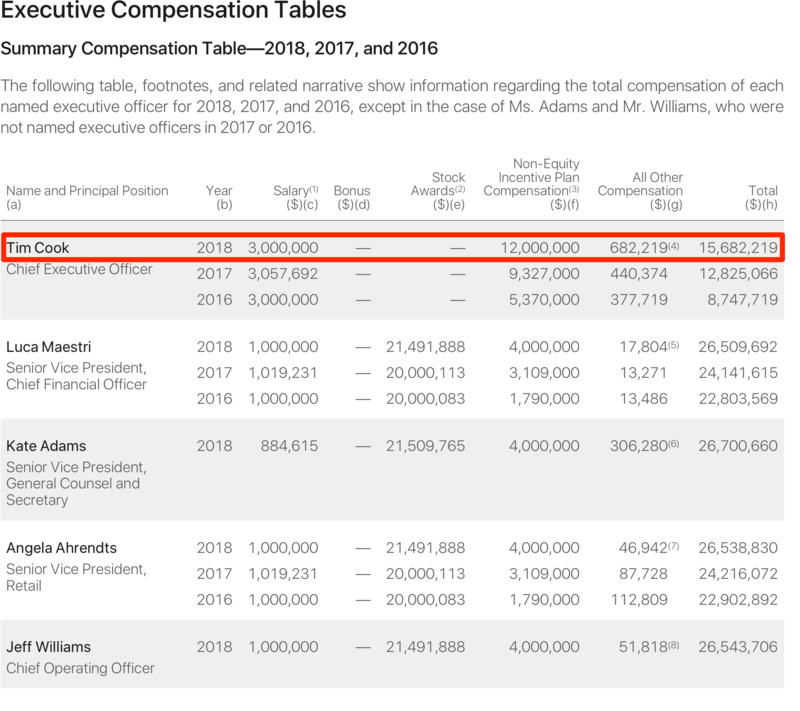 His pay of $15.7 million (incentive compensation + base salary) was about 283 times the annual median Apple employee’s pay, which was $55,426 in fiscal 2018. Since becoming the CEO in 2011, Cook has made about $650 million in AAPL stock. Other executives were awarded fat bonuses for 2018, too, including finance boss Luca Maestri, general counsel Kate Adams, retail head Angela Ahrendts and operations chief Jeff Williams. On top of their $1 million base salary, they made more than $26 million in total 2018 compensation each, stock awards included. 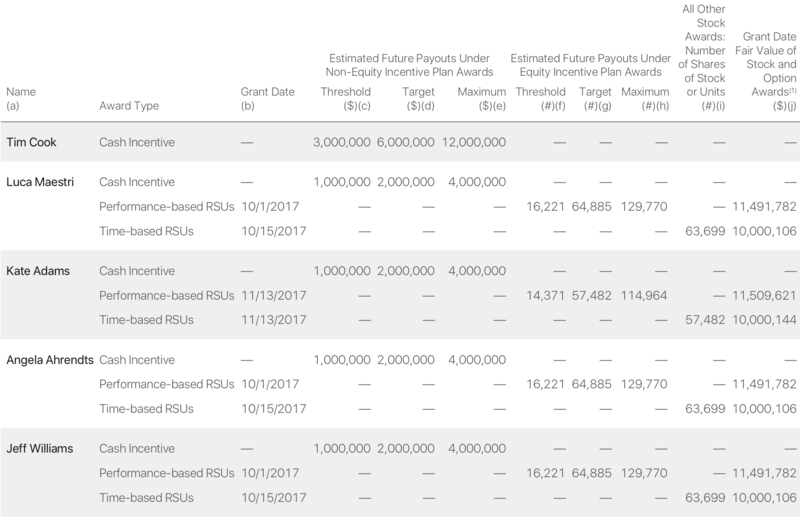 The following table shows Apple’s plan-based 2018 incentive awards granted to the executives. And these are the outstanding equity awards held by key executives as of September 29, 2018. The following table shows information regarding the compensation earned or paid during 2018 to non-employee directors who served on the company’s board during fiscal 2018. Know that Tim Cook does not receive any compensation for his service as a member of the board. The amounts shown include matching charitable contributions under Apple’s matching gifts program $4,500 for Bell, $20,000 for Jung and $20,000 for Sugar). Like Bill Gates and some other high-profile executives and investors, Cook has decided to give away the vast majority of his billions during his lifetime. He also approved a company program that matches employee charity donations. This is in stark contrast to Cooks’ predecessor Steve Jobs who was never big on philanthropy. 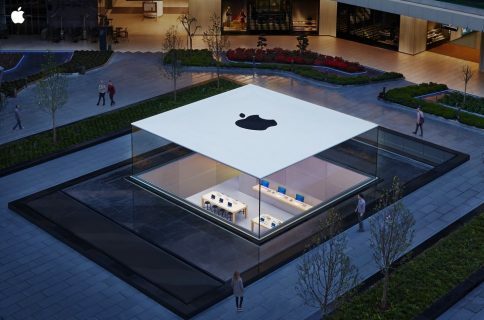 What do you make of Apple’s SEC filing? Let us know by leaving your thoughts in the comments down below.